As winter sets in, the polar vortex is becoming a much stronger force to be reckoned with. The polar vortex is an immense low pressure and cold front that encompasses both of the Earth’s poles. Around this time of the year, the polar vortex may expand and generate cold air towards the southern areas of the earth. 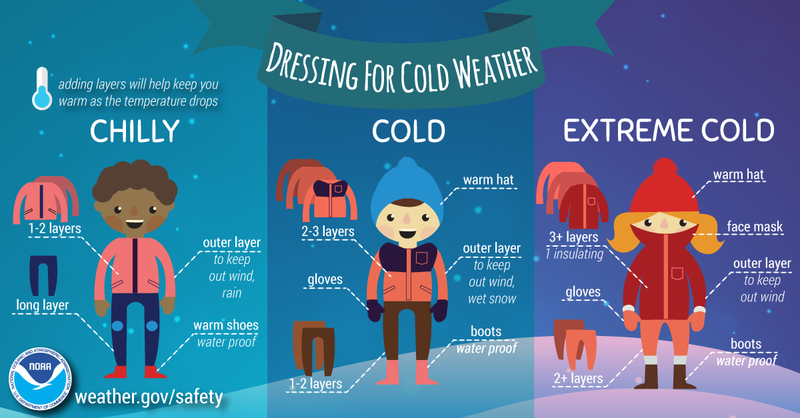 And though it’s a natural and normal occurrence of the earth, you should still be more aware of the colder temperatures this upcoming weekend, so here are a few tips on how to conquer this winter season. Check the Forecast at govor your favorite weather app, station, etc. : Make checking the forecast part of your regular routine so you'll know when to expect cold weather. Protect Your Pets, Livestock and other Property:If you have pets or farm animals, make sure they have plenty of food and water, and are not overly exposed to extreme cold. Take precautions to ensure your water pipes do not freeze. Know the temperature thresholds of your plants and crops. Fill up the tank:Make sure your car or vehicle has at least a half a tank of gas during extreme cold situations so that you can stay warm if you become stranded. Ice scraper:Even if you usually park in a garage, have one in the car. Blanketsor sleeping bags: If you get stranded in traffic on a lonely road, you'll be glad to have it.